Never thought Frisbee was an actual competitive sport where people would not just win the match but they win the hearts. In the past, I have played Frisbee many times, but something was different about the way Project KHEL plays Frisbee. I asked my mentor, Akshai,“what is so different about playing Frisbee here”; he replied saying “it’s not just Frisbee, it’s Ultimate Frisbee.” Later, after attending regular sessions of Frisbee at 6 in the morning I realized, there is no referee in the game, girls and boys play together as a team and if any foul is called then it’s the teammates who have to come up with a solution and decide what it is. I found out that the motive behind this was to make the player themselves understand and take responsibility for all the action that takes place. Playing Frisbee wasn’t something new for me but playing Ultimate Frisbee was something super new! I thought that Frisbee was just a disk that you take when you go out for a picnic. Never knew it had a proper style of playing like backhand throw, forehand throw, disk-in, forehand defence, backhand defence, stage and all other terms were like new born words for me. Looking for both boys and girls playing together in a single team made me feel amazed. Now it was my turn to get into the sport and learn something. As I was a beginner I thought that I would not be given that much of importance because they play at the national level and we are way below their level. However, my assumption was shattered down to pieces when some of the children came to me to teach me how to play Frisbee! They were very friendly and welcoming. Every day when we reached there they all used to come to me and say “good morning bhaiya” and it was so welcoming I don’t have enough words to describe it. However, I can exactly describe the whole situation of warm up time that we have before we start playing. As Exercise was the first thing that we used to do as we reach there I used to take a lot of time to just get ready. However, we had to run 5 rounds of the field, and then do tight exercise. It was tough for me to run and do exercise because I was too lazy to do that but still I did because those kids supported me and ran with me all the way till the end and I didn’t feel like giving up. After exercise, we do some drills where we learn specific frisbee skills. It was fascinating to watch them swing the disk in different styles but I didn’t realize the hard work that they did to achieve these skills until I was actually made to do that. It was tough, and for sure it was not a piece of cake. It took me around 10 days to learn the backhand throw, which is still not perfect compared to other kids. However, forehand throw was much more difficult and therefore I was not able to learn it during this time period. Now I realize that how much hard work they have put in to learn all the skills that they have gained. 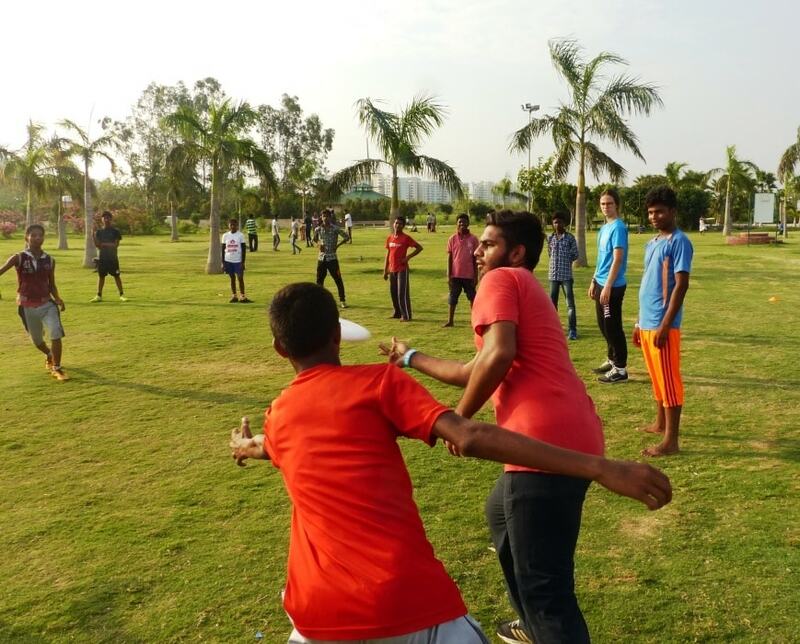 Overall it was a charismatic experience playing ultimate Frisbee with Project KHEL. I will never forget the values that they have thought me, the love that they have shared, and the memories we have made. I am sure that I will be taking an initiative to bring up this concept of ultimate Frisbee in my school at AGA KHAN ACADEMY HYDERABAD.